Trinamool Congress held a 'peace rally' in West Bengal's Bhangar that has witnessed violence over the construction of a power grid substation. 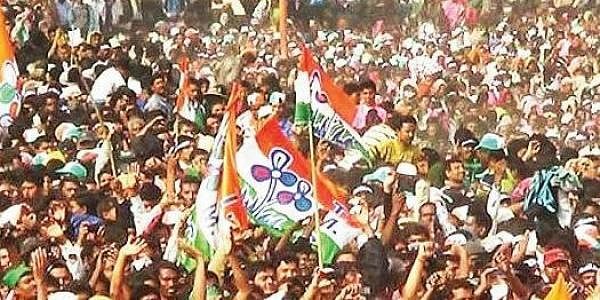 KOLKATA: Demanding that "outsiders" immediately leave the villages in the area and arguing in favour of overall development, the Trinamool Congress on Saturday held a 'peace rally' in West Bengal's Bhangar that has witnessed violence over the construction of a power grid substation. The development comes two days after several people were injured and vehicles set ablaze in a clash between a group of protesters agitating against the power grid project and Trinamool Congress activists on Thursday. Claiming that all the villagers were united, local Trinamool Congress leader Kaizer Ahamed urged the outsiders to immediately leave Bhangar and said they are capable of solving the local disputes by themselves. "The outsiders are creating tension in two of the villages in Bhangar. We want to send a message to them through today's rally. We want them to immediately leave Bhangar. The villagers would be able to sort out the disputes locally," Ahamed said. "We want to convey that we are in favour of development. We want the power grid here so that the electrification in Bhangar gains more rapidity," he claimed. The Trinamool leader said they have called upon the residents of all the villages to attend the rally. "The development is happening all over the state under the leadership of Mamata Banerjee. Bhangar will not be any exception. She has asked us to give special focus to the disputed villages here. We will follow her orders," he added. Bhangar in South 24 Pargana district witnessed massive agitation by the villagers this January over the state government's power grid project that killed two locals and injured several. The villagers backed by Jami, Jibika, Poribesh O Bastutantra Rakha Committee -- a platform for villagers backed by Naxalite outfit CPI(ML) Red Star, turned the anti power grid agitation into a land stir demanding the state government to return their land and stop the construction of the power grid.